The first performance review of the AMD A10-7850K Kaveri APU has been published by PugetSystems. The review pits the flagship Kaveri APU A10-7850K against the A10-6800K and Core i5-4430 which is Intel’s similar priced mid-range solution. The A10-7850K sample received by PugetSystems is the final retail version and comes with a price tag of $172.99 US. On with the specifications, the A10-7850K as expected would remain the flagship Kaveri APU of 2014 boasting 4 Steamroller cores, 4 MB L2 Cache and clock speeds of 3.7 GHz base and 4.0 GHz turbo. 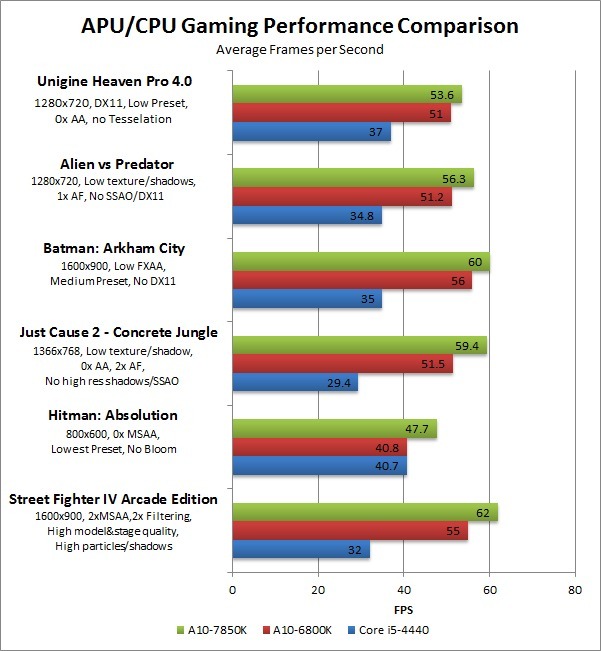 On the graphics side, the APU would feature 8 Compute Units resulting in 512 stream processors clocked at 654 MHz base and 720 MHz in boost. The APU is fully unlocked allowing users to overclock the chip past the limits and supports DDR3-2133 MHz and comes in a 95W TDP package. AMD officially announced their 2014 A-Series lineup yesterday. For the lineup, AMD would launch only two APUs to kickoff 2014 which include the A10-7850K and A10-7700K while the A8-7600 would launch later in Q1 2014. For Full Architecture Preview, visit this link.! For Full Performance Preview, visit this link! 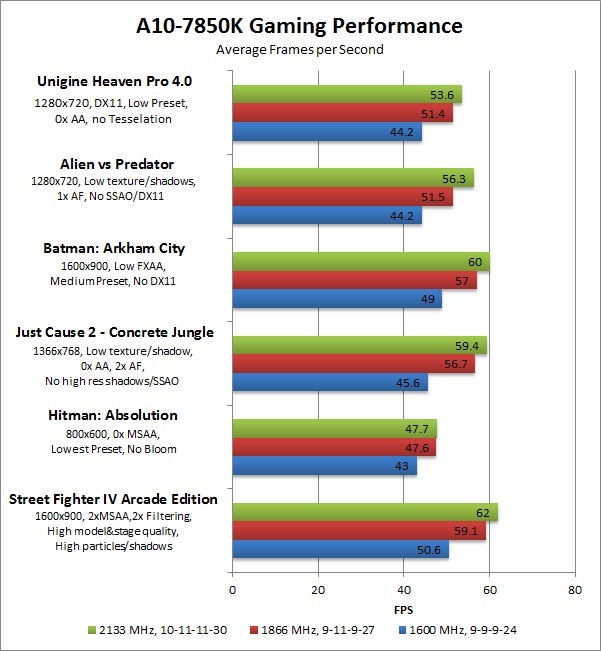 For performance, the source pitted the chip against the A10-6800K and Core i5-4430 in gaming and general processor benchmarks. 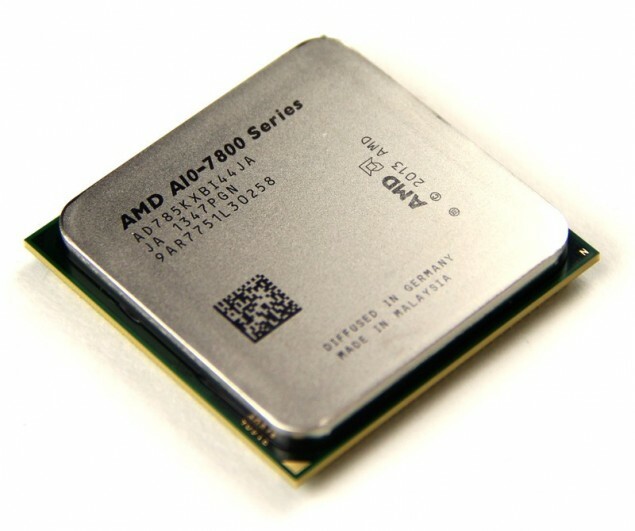 The A10-7850K was tested with several memory configurations with the faster clock memory bringing higher performance in gaming benchmarks and the A10-7850K taking a definite lead against the Richland and Haswell processors in gaming performance due to its much enhanced GCN architecture on board the die. 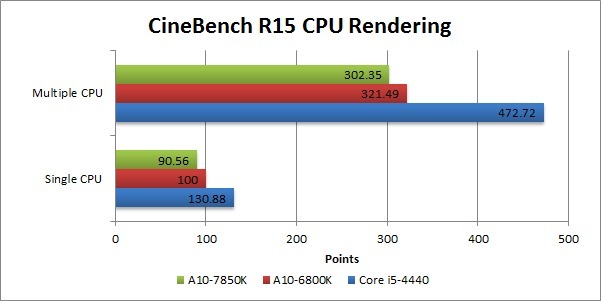 The CPU side had mixed results with the A10-7850K leading past the Richland in PCMark 8 but falling behind the A10-6800K in both GeekBench and CineBench R15 CPU rendering benchmark. 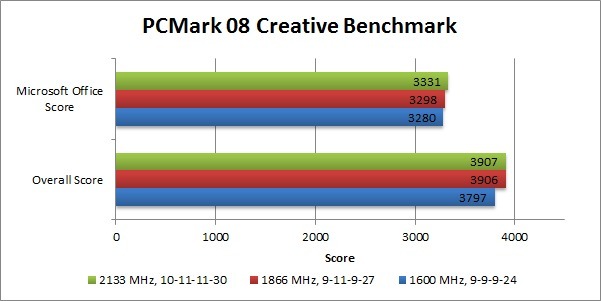 The Core i3-4430 was on top of both APUs in terms of CPU performance. 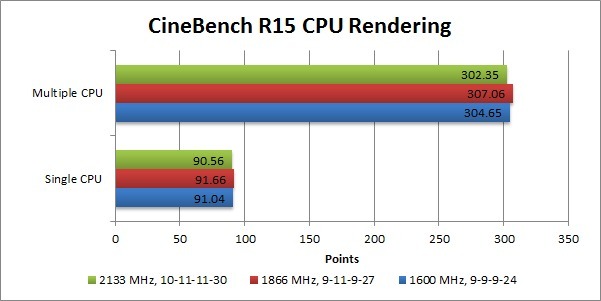 It is quite odd to see Steamroller cores falling behind Piledriver cores in Cinebench R15 since AMD slides clearly show a 20% IPC lead of Steamroller over Piledriver. Nevertheless, the APU as a whole is a complete package which aims to deliver great gaming and general performance for a price of $173 US. 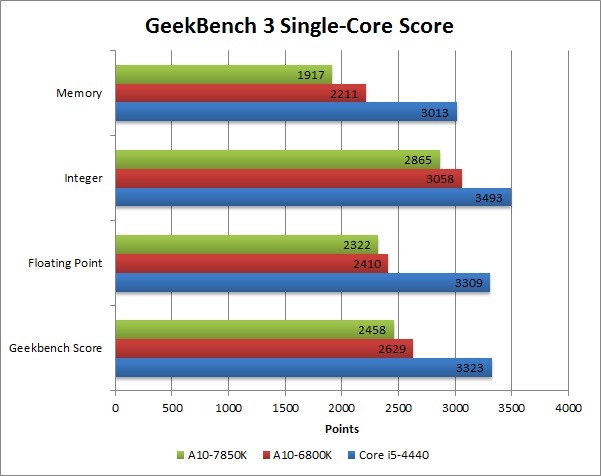 In terms of CPU performance, the A10-7850K is overall an improvement over the A10-6800K. 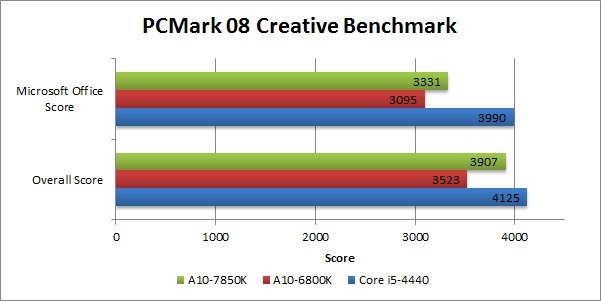 Especially in PCMark 08, the A10-7850K was about 10% faster than the A10-6800K. 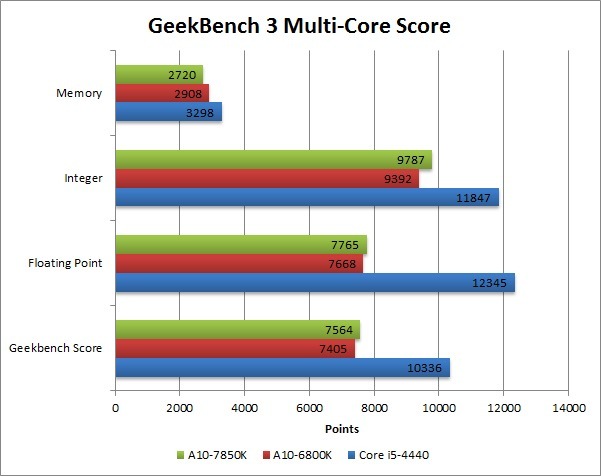 Our GeekBench benchmark indicated lower single-core performance, but as more and more programs use multi-core technology, that is really not even much of an issue. 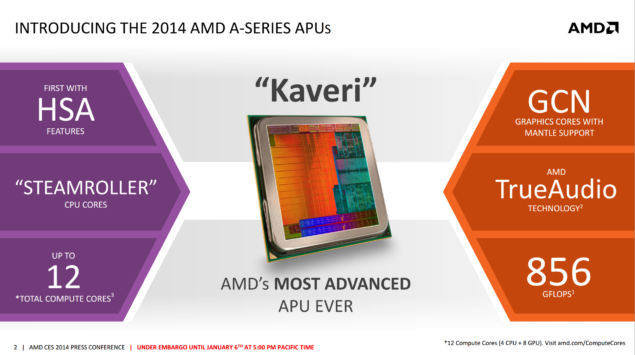 AMD’s Kaveri APU would launch next week on 14th January and would bring the power of Steamroller, GCN and HUMA in the hands of users on a single chip. Expect more performance previews in the days ahead.